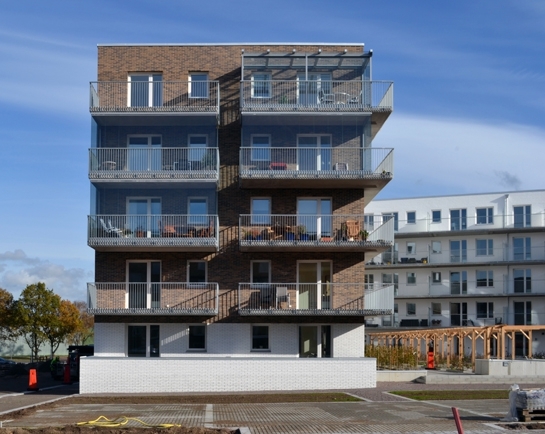 This apartment block is located in the outskirts of Helsingborg in Scania. The building has 59 condominium apartments realized by Riksbyggen jointly with Bonum in Helsingborg. Adding to the apartments are a few shops, a laundry on the street level and an underground garage. The design of the building follow a town-planning scheme that was decided by the Helsingborg municipality prior to the design of the building. The facades are clad in brick of various colors and surfaces. On the upper levels, facing the street, there is a brown Danish brick. Along the street levels the facades are in white glazed brick. By the terraces on the courtyard-side of the building all the bricks are painted white.